Our economy 200 lb. 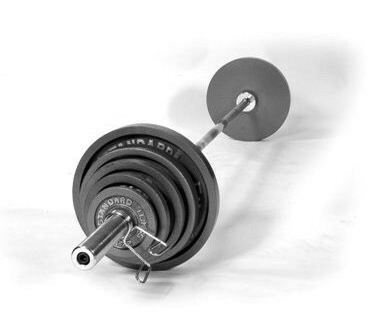 Olympic weight set comes with everything a beginning lifter needs to get started. A 165 lb. set of grey Olympic weights (2 x 35 lb., 2 x 25 lb., 2 x 10 lb., 4 x 5 lb., 2 x 2.5 lb.) an economy 35 lb. 7 chrome Olympic bar (300 lb. capacity), and a pair of spring collars. 90 day warranty against breakage, does not cover bending or rust of bar.